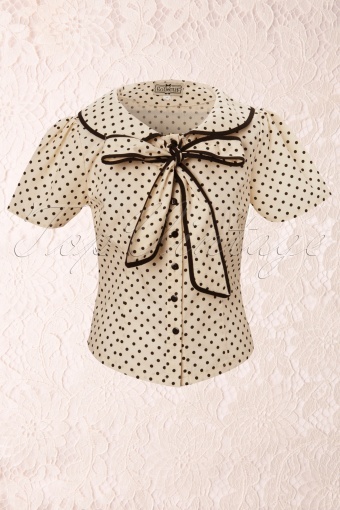 50s Lucille blouse polka beige black Bow from Collectif. Elegant fifties vintage style blouse. Round collar with wide sleeve and wrinkles at top. At front 2 loose straps to make a bow to give it a real fifties bow. Made of a light cotton fabric in creme with a black polka dot print. This short top is perfect to be worn unto a high waisted pencil skirt for a truly vintage look. Joëlle wears our Pinup Couture skirt. As seen in the Dutch magazines Cosmogirl, Vriendin and Margriet! 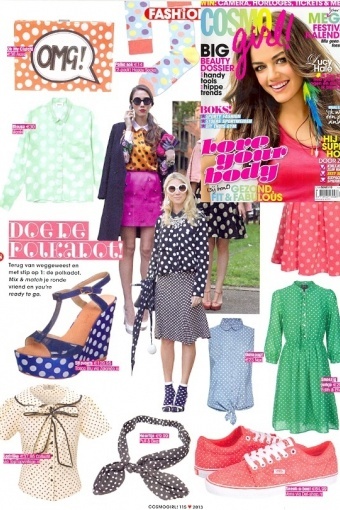 Sandra Ysbrandy wore our blouse in Life 4 You!